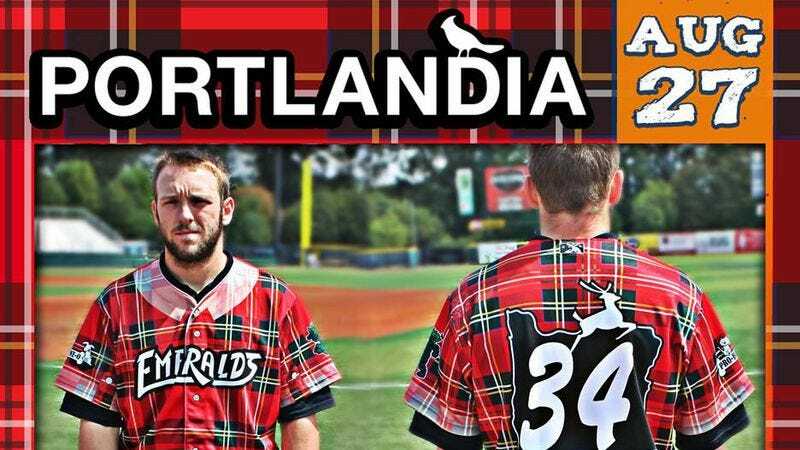 While it’s nice that Portland seems to have a sense of humor about itself, a nearby minor league baseball team may have taken things a bit too far with a new set of Portlandia-inspired uniforms. Composed of horrific looking “flannel” tops and “skinny jean” pants—really, just those clothes laser-printed onto whatever baseball uniforms are made of—the Eugene Emeralds’ uniforms are a horrific amalgam of irony and modern technology. Seriously. Just look at these things. Wacky uniforms are minor league baseball’s bread and butter, but what is even going on with those fake pockets? Would Carrie Brownstein wear a flannel shirt that looks like a pajama top from the ’70s? No. The Cubs’ single-A affiliate is set to wear the fabric nightmares for its August 27 Portlandia Night at PK Park. They’ll play the dubiously-named Spokane Indians, and fans in attendance can bid on game-worn jerseys during the actual event. Other Portlandia-related events set for the night include a pregame kickball match and both special treats and pickling advice provided by the Kurzhal Family Kickin’ Pickles.